Mark David Loretta (born August 14, 1971) is an American former professional baseball infielder and current bench coach for the Chicago Cubs. 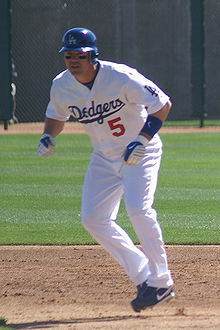 He played fifteen seasons in Major League Baseball (MLB) between 1995 and 2009 for the Milwaukee Brewers, Houston Astros, San Diego Padres, Boston Red Sox, and Los Angeles Dodgers. Loretta coached the Israeli national baseball team in the 2013 World Baseball Classic qualifier in September 2012. Drafted by the Milwaukee Brewers in the seventh round of the 1993 Major League Baseball draft out of Northwestern University, Loretta made his professional debut with the Helena Brewers in 1993. He subsequently played with the Stockton Ports, El Paso Diablos and New Orleans Zephyrs. He was selected to the American Association All-star team during the 1995 season. Loretta made his Major League debut on September 4, 1995 for the Brewers against the Minnesota Twins and recorded his first hit on September 10 against the Texas Rangers. He remained on the Brewers every day roster as a utility player through 2002. On June 20, 2001, during an 11–3 loss to the Cincinnati Reds, Loretta took the mound to pitch a scoreless eighth inning. Brewers manager Davey Lopes asked the team for a volunteer to pitch an inning in hopes of saving the depleted bullpen, and Loretta volunteered. He had not pitched since college. Loretta faced five batters, gave up one hit and one walk and got two strikeouts on 19 pitches. He was the first everyday player to pitch for the Brewers since 1991. Loretta was traded to the Houston Astros during the 2002 season for Keith Ginter and Wayne Franklin, and played in 21 games as a reserve before filing for free agency. He signed with the San Diego Padres in 2003. His most productive season came in 2004 for the Padres, when he batted .335 with 47 doubles, 16 home runs, 76 RBI, 108 runs scored, and 208 hits – all career bests, and good enough to earn him a spot on the National League All-Star team. His .335 average ranked him third in the National League batting race behind Barry Bonds (.362) and Todd Helton (.347), and he also joined Tony Gwynn as the only San Diego players to have 200 hits in a regular season. He was voted Padres team MVP in 2003 and 2004. In 2005, Loretta hit .280 with three home runs and 38 RBI in 105 games with the Padres, after he had surgery to repair a strained ligament in his left thumb. Loretta batting for the Red Sox in 2006. During the 2006 offseason, Loretta was traded to the Boston Red Sox in exchange for catcher Doug Mirabelli. In 2006, Loretta hit .285 with five home runs and 59 RBI in 155 games with the Red Sox. Loretta was awarded a start at second base for the American League in the 2006 MLB All-Star Game. Due to various injuries to teammates, Loretta also filled in at first base and as the designated hitter at various points during the season. He hit his first career walk-off home run on April 17, 2006, against the Seattle Mariners on Patriots' Day at Fenway Park. This was also his first home run of the season. Loretta with the Astros in 2007. On January 4, 2007, Loretta signed with the Houston Astros on a one-year contract to serve a utility role. On June 29, 2007, with 2 outs and behind one run, the Colorado Rockies intentionally walked Carlos Lee who had hit a walk-off grand slam the night before. Loretta then hit a 2-run homer for another walk-off home run the second night in a row. On December 10, 2008, Loretta signed a one-year contract with the Los Angeles Dodgers for reported $1.25 million. On October 8, 2009, Mark Loretta hit a walk-off single to defeat the St. Louis Cardinals, 3–2, in game two of the National League Division Series. The score was tied and the bases were loaded with two outs when he stroked a line drive off Cardinal reliever Ryan Franklin to center fielder Colby Rasmus. Until this game-winning single Mark Loretta had been hitless in his career against Franklin. His single completed a come from behind victory for the Los Angeles Dodgers who trailed the Cardinals, 2–1, going into the bottom of the ninth inning. Loretta said, "That's the biggest hit of my career." This sudden victory enabled the Dodgers to take a two games to none lead in the division series. They would go on to win the series, 3–0. Loretta retired after the 2009 season. He joined the Padres as a special assistant to the baseball operations staff in 2010. On January 2, 2019, he was named bench coach for the Chicago Cubs. Loretta coached the Israeli national baseball team in the 2013 World Baseball Classic qualifier in September 2012. Israel lost to Spain in extra innings in the Pool Finals, missing out on a spot in the World Baseball Classic. Loretta attended Saint Francis High School in La Cañada, California, and he was a classmate of Gregg Zaun. Loretta has a wife named Hilary (née Kaplan), son named Frankie, and daughter named Lucy. His parents are David and Ellen Loretta, and he has a brother Chris and a sister Kelly. Loretta is also a member of the Fraternity of Phi Gamma Delta, commonly known as FIJI (Northwestern University, 1993). ^ "Brewers' trade history is marked by blockbusters, busts". onmilwaukee.com. Retrieved September 6, 2013. ^ "Red Sox trade Mirabelli to Padres for Loretta". ESPN.com. December 7, 2005. Retrieved September 6, 2013. ^ "Astros, Loretta agree to one-year deal". MLB.com. May 24, 2013. Retrieved September 6, 2013. ^ "It's official: Loretta joins Dodgers". MLB.com. May 24, 2013. Retrieved September 6, 2013. ^ T.J. Simers (October 9, 2009). "Dodgers game was too good to miss because of one player". Latimes.com. Retrieved September 6, 2013. ^ Caleb Bacon (October 8, 2009). "A Magical Ninth, An Improbable Dodger Victory". Laist.com. Archived from the original on May 29, 2016. Retrieved September 6, 2013. ^ Dylan Hernandez (October 9, 2009). "Victory drops in Dodgers' lap". Los Angeles Times. Retrieved September 6, 2013. ^ Grossfeld, Stan (September 17, 2012). "Team Israel competing in WBC Qualifier". Boston Globe. Retrieved September 6, 2013. ^ a b New Jersey (March 3, 2013). "Mets' Q-and-A with utility player Josh Satin". NJ.com. Retrieved September 6, 2013. ^ Corey Brock (October 25, 2012). "Padres prospect Freiman looks to raise his game; First baseman enjoys the competition in World Classic, Arizona Fall League". MLB.com. Retrieved March 12, 2013. ^ "Astros select Fields, Freiman in Major League portion of Rule 5 Draft" (Press release). MLB.com. December 6, 2012. Archived from the original on May 11, 2013. Retrieved March 12, 2013. ^ "MLB: St. Francis Alum With the Game Winner". Sfhs.net. August 9, 2013. Archived from the original on February 2, 2014. Retrieved September 6, 2013. Wikimedia Commons has media related to Mark Loretta. This page was last edited on 15 February 2019, at 16:59 (UTC).